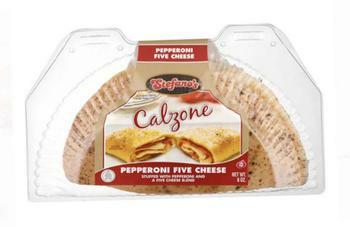 Smithfield Packaged Meats, doing business as Stefano Foods of Charlotte, N.C., is recalling approximately 24,048 pounds of pepperoni five cheese calzones. The product may be contaminated with extraneous materials -- specifically pieces of hard, sharp, clear plastic. One consumer has reported suffering a small oral laceration while consuming the product. The recalled product, bearing establishment number “EST. M-19140” inside the USDA mark of inspection, was shipped to retail stores nationwide. Consumers with questions about the recall may contact Wendy Johnson at (877) 933-4625 or by email at WJohnson@Smithfield.com.